Spending 10 minutes or more scraping ice from your windshield or spraying deicer everywhere is not a great way to start your day. A simple windshield cover for the winter will save you all this hassle and prevent any damage to your wiper blades. The best windshield cover is the FrostGuard Premium Winter Cover that has superior materials that reduce the chances of your windscreen icing up. There are a range of windshield covers available that tie around the wing mirrors or to the wheels. Either take less than a minute to setup and protects your vehicle from snow or other debris that can cause a nuisance. Many windshield covers have the ability to work perfectly in the winter as well as the hot summer days. However, a windshield cover for the winter will save you the most amount of time instead of scraping ice and snow from the car. Many of the covers you can buy for vehicles windshield are universal and come with a range of sizes that will fit all. It is always advisable to double check your measurements before parting with your money. If you find yourself clearing your windscreen of snow and ice on a daily basis, it is a no brainer. Below is a list of the best windshield covers for winter that come in a range of sizes and methods of securing the cover to your car. The FrostGuard is an expensive choice but an investment that will save you time and hassle clearing snow and ice. Not everyone is lucky enough to have their own garage or highly rated carport to hide away from the snow but this is the best windshield cover for winter that is up to the job. The patented “FitFast” system attaches to the wing mirrors and holds it down securely with ease. It will take you less than 30 seconds to fit or remove this windshield cover and it has its very own compact pouch for easy storage when not in use. Overall, it is the best cover for your windshield to protect against snow and ice. There are many sizes that will provide a tight and reliable fit for years to come. It is recommended that you fit the cover to the vehicles windshield only when its dry. One of the main issues with the FrostGuard is the expensive price but there are many cheaper alternatives. The VIVVAUTO is one of those cheap windshield covers that provide waterproof protection against snow and ice. The VIVVAUTO is the recommended windscreen cover for wind because it is secured by a number of methods that include 3 magnets, 2 door flaps and held by the side mirror via elastic plastic. It is an all weather windshield cover for both winter and summer that is easy to clean, padded soft fabric that reduces scratches and many other benefits. It is the best windshield cover for the money and highly rated worldwide. The Ice King is a popular cover across the US that is universal in size to work with most cars, trucks and SUVs. As the branding suggests, the purpose of this cover is to reduce ice build up on your windshield. IceKing state that this windshield cover is waterproof, snow-proof and ice-proof, which is the perfect recipe for a winter windshield cover. At 50 by 70 inches, it is much bigger than the majority of covers for a truly universal fit. Overall, the Ice King claims that their magnetic cover is the best and is guaranteed with a 30 days money back policy. OxGord produce a range of automotive products targeting those on a budget yet retain high quality goods. It is a heavy duty windshield cover that uses magnets with a specialized lip that pulls the cover across the glass using both front doors. Stealing of windshield covers is fairly common unfortunately. However, the OxGord cover folds inside the doors that makes it the hardest to steal and would require cutting, which would make it worthless to the thief anyway. Overall, the OxGord cover is the best cheap windshield cover for the money and has the added benefit of being highly secure. The Fulfilledba is the thickest windshield cover available that offers more protection than most. Debris and other objects are prone to hitting windshields and causing damage in the wind but the Fulfilledba has extra padding for more protection. The 4 layers of PEVA aluminium foil offer other benefits such as a fire and scratch resistant, therefore a heavy snow and ice is nothing to worry about. Even with the extra materials used to make this cover thicker, it is still very reasonable priced. It is the best windshield cover for protection and offers great value for money. Covers for your windshield in the winter provide so many benefits including no more deicing or scraping the ice from your windshield, protection against debris and more. Frequent scraping of ice from your windshield will also increase the risk of scratches to the glass too. To repair these scratches, you would need a polish to remove glass scratches, which would be another cost added on because you still not using a winter windshield cover. The cost of a windshield cover is not as expensive as you would have first thought. The cost of around 10 bottle of dicing spray would probably match the price of a cover that would last many years of use. There are many more but the above four are most popular. In terms of the most secure, inside the door fitments are virtually impossible to steal. However, if its windy it may be fairly hard to keep it on and shut the door at the same time. A mixture usually offers increased security but again, will require more time. The majority of covers come with universal fittings for small, medium and large vehicles. Always measure the dimensions of your vehicles windshield beforehand and then allow for a small amount of overhang. A slight overhang is better than being too small because the small bit of the windshield that is left visible will become iced over and require dicing. A winter car windshield cover is a cheap yet highly useful product that will speed things up on snowy or icy mornings. 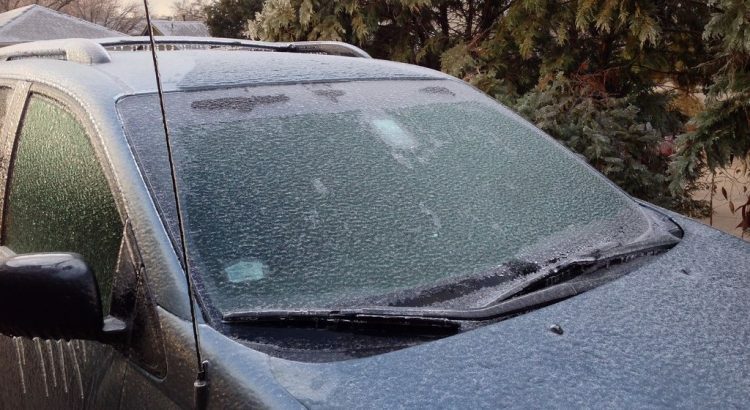 No one enjoys a frozen windshield in the morning and a cover is an automotive product that everyone can benefit from. All of the above windshield covers mentioned above will not disappoint. The FrostGuard excels in terms of the design and functionality but it is expensive compared to the cheaper alternatives. Some people may use these winter covers as a windshield sun shade but they will not be as effective as a true sun shade. Plus the fabric used will not be effective at reflecting the heat away from the car.